On November 11th, 1985 The Chamber of Commerce for the Borough of Hawthorne dedicated a Rescue truck to the Borough of Hawthorne. Responding to the needs of the Borough the Chamber purchased a 1985 Ford LN9000 Chassis with an 18ft box from Saulsbury fire apparatus. 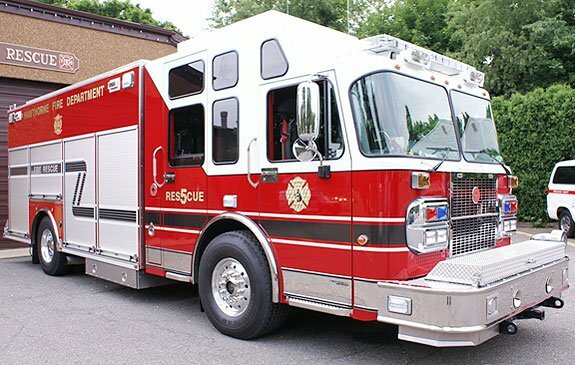 Later that same month, this Rescue truck was placed into service by the Hawthorne Fire Department. 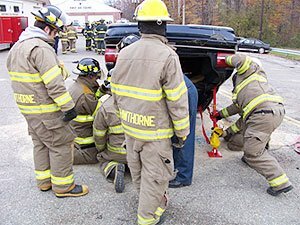 For many months prior members of the Hawthorne Fire Department worked within the Department and with the Chamber to organize and create a fifth fire company within the Hawthorne Fire Department. This fifth fire company being stationed out of the newly created fire headquarters on Lafayette Ave extension where it still exists. The founding members of this company came from the existing 3 engine companies and 1 ladder company. The original members of Rescue Co 5 are as follows. Through the years since the company’s inception our ranks have grown to include over 20 active members. 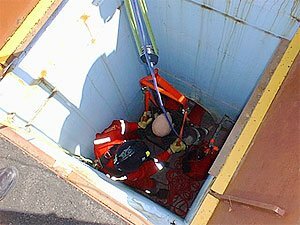 The members of Rescue 5 must complete all firefighter classes as directed by the Department as well as a Heavy Rescue program which includes courses in Vehicle extrication, Rope Rescue, Confined Space rescue, Trench Rescue, and both water and ice rescue classes. 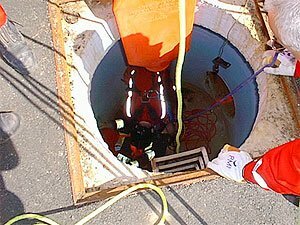 The members also complete training in Hazardous Materials operations and other technical rescue classes. 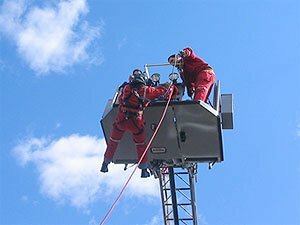 The rescue company is the primary water rescue response for the borough. A rescue boat has been operated out of Rescue 5 since its inception back in 1985. 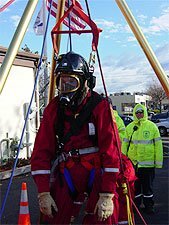 Since 1985 the members of Rescue 5 have responded to thousands of calls within the Borough of Hawthorne and in our surrounding communities doing mutual aid with our neighbors. Rescue Company 5 responds with the Hawthorne Fire Department on all general alarms for the Department. 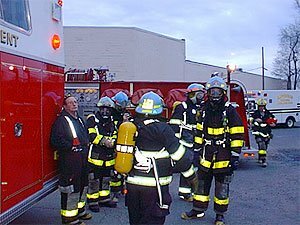 These include activated fire alarms, carbon monoxide alarms, working fires, hazardous conditions, hazardous materials calls, all water and related incidents, confined space operations and motor vehicle accidents. 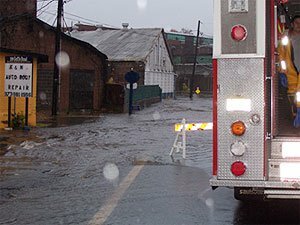 Rescue 5 responds to local flooding within the Borough. 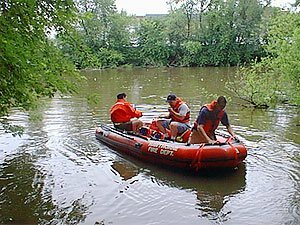 Rescue boat operations on the Passaic River. A founding member of Rescue Co. 5 and the Companies First Asst. 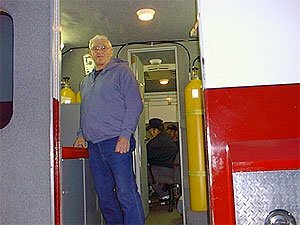 Chief Lou spent over 50 years serving in the Hawthorne Fire Dept. 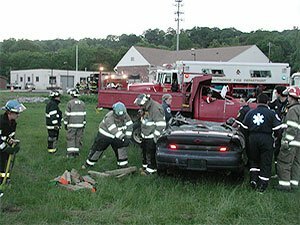 Motor Vehicle Extrications has been the companies main rescue calls. 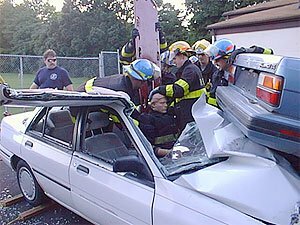 Here members practice removing injured victims from a vehicle, which was opened up to remove victims without further injury. Rescue members working at a 3 day extrication class. Vehicle stabilization and new car safety technology were covered in this class. Members of Rescue 5 waiting for assignment at a Building fire drill.